People will no longer ask what company is in Jackie Mauldin's old garage. Instead, they'll just ask what OrangeCoat does. So be it. PS: The sign company that did this sign was Gimme-A-Sign and they did a great job. Jim's dad has a sign company called Sign Me Up. I believe the number of sign puns for sign companies is infinite. PPS: This last picture has nothing to do with the office sign but I found it on the camera. 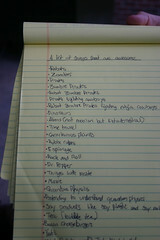 Lord wrote this original "list of things that are awesome" a while back (here is his blog post on it). This was before I explained to him about the terror that are robots. note that on my list of things that are not awesome are listed both hostile and friendly robot take-overs. I'm generally pretty cool with robots as long as they are obeying Asimov's laws and not doing the whole "DESTROY ALL HUMANS!" thing. Well it's about time! JK. It looks good. I can't wait to find out how many women start stopping by your office every week wondering if you sell coats. Looks pretty damn good though. Melikes. The sign looks great. I'm so proud of you guys... from a dry erase board in Evan's room, to that, it's really awesome. Keep up the good work. Sign looks great against the dark brick. Very nice. The boys are all growed up! It's such a pleasure to drive by that logo every day. I wish I could drive by it every day, but it'd be one heck of a commute. The whole building looks great. I'm just so tickled for you guys - was good to see you (and meet Lord too)! Elyse, oh sister of mine, I was the first ET. ;) Thanks for the comment. I finally saw it yesterday (post "Other Side") and it looks so good, I almost had a tear in my eye. Pretty sweet, guys. I dig it.